I dare say most know nothing further about the man behind this lyrical name. However, he was one of Ireland’s most dedicated patriots and he died on August 24, 1803, far from the land he loved. Born in Dublin, he was baptized, ‘James Napper Tandy’, in St. Audoen’s Episcopal Church on 16 February 1739. His father was a merchant. His mother, Maria Della Jenkins’ held Napper as part of her family ancestry and owned land in Co. Meath. It was the merging of the two families’ in marriage that led to Tandy’s unique name. The Nappers lived in Loughcrew and represented the Boroughs of Trim and Athboy in Parliament. They were the landed gentry of the time. Tandy was educated at a Quaker Boarding School in Kildare, after which he set himself up as an Ironmonger in Dublin. His character soon led him into the Political arena where he was elected as a representative on the Guild of Merchants where he exposed corruption. An able Orator, at the outbreak of the American Revolution he sided with the colonists. In 1778, local volunteer militias were raised to guard against invasion since British soldiers were sent from Ireland to fight in America. Tandy joined and became Commander of a Volunteer Corps. When the British put restrictions on Irish Trade he urged the Irish people to boycott English goods. Taking advantage of the growing power of the Volunteers, Tandy was able to pressure Westminster into conceding legislative independence to the Dublin parliament. On November 10, 1783 he and his Corps marched through Dublin to the Rotunda where Parliament was meeting to discuss reform. He lined up his cannon on the green facing the Rotunda with a sign that read Free Trade or This. He got the restrictions on Irish traded lifted. 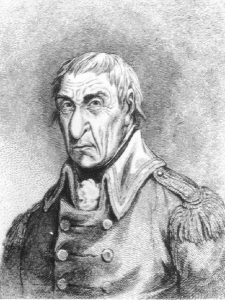 After the American Revolution the Volunteer’s power declined, yet Tandy was still able to get Henry Grattan elected to the Irish Parliament. Towards the end of 1791 together with Wolfe Tone and Thomas Russell, he founded a branch of the United Irishmen in Dublin and became its first Secretary. From the outset, Tandy tried to establish a better understanding in Parliament between Catholics and Protestants. Attorney General, the Earl of Norbury, said that Parliament would not be lectured to by Political Quacks and Tandy challenged him to a duel. The matter was brought before Parliament and Tandy was charged with breach of privilege for challenging the Attorney General. He was arrested on April 18, 1792 and brought before the Bar of the House. He refused to answer any questions put to him, but since Parliament was about to go into recess and recognizing his popularity, Tandy was set free. He revived the Volunteer movement with the help of Hamilton Rowan and managed to raise two battalions of a thousand men each. The British administration issued a Proclamation against unauthorized bodies taking up arms and ordered Tandy arrested. Word reached Tandy and he laid low until he could make his way to America. He reached Philadelphia at the end of 1795, as Wolfe Tone departed for France. Tandy made his home in Wilmington on the banks of the Delaware River for two years and in 1797 went to Paris where he met up with Tone. Tone had arranged for a French invasion force led by General Humbert to liberate Ireland. The French made Tandy Commander of “The Anacreon”, a Naval Corvette. They also assigned to him some soldiers as a nucleus of an Irish force to assist in liberating Ireland. On September 4, 1798, Tandy set sail for Ireland landing on the Donegal coast where he raised the flag of the United Irishmen. Learning that Humber’s expedition had been routed, he returned to his ship and sailed for Hamburg. On arrival in Hamburg, he put up in the American Arms Hotel, but on November 24, he was arrested. He didn’t surrender without a struggle, but eventually Police disarmed him and he was extradited to England. On February 12, 1800 he was brought before the Kings Bench in Dublin to answer charges of treason. He pleaded guilty and was sentenced to be executed on May 4. His life was spared when Napoleon Bonaparte refused to sign the Treaty of Amiens until Tandy was released. The British conceded and Tandy was set free in March of 1802. The Treaty of Amiens temporarily ended hostilities between France and England. Tandy returned to France and when he Tandy landed in Bordeaux on March 14, 1802 he was received warmly by the French people who gave him a public ovation and held a banquet in his honor; he was also raised to the rank of General and granted a full General’s pension. Napper Tandy never returned to the Ireland he loved. He died in Bordeaux of dysentery on August 24, 1803. Perhaps if he had met his death on the Gallows, he would have had a more prominent place in Irish History. Yet the patriot who dies in bed is no less a man for all that he had done.